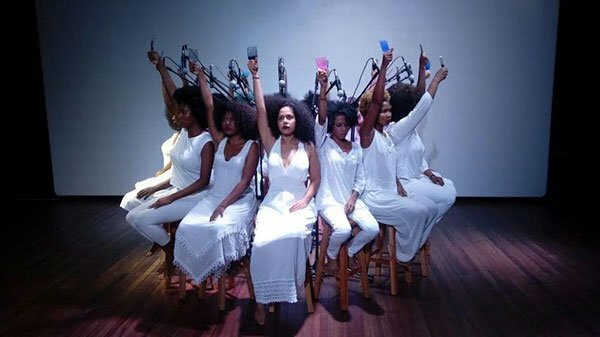 Image Credit: Satch Hoyt, Hair Combing Cycle 1530, performed by Ensortijadas Colombianas, performance presented at the Museo La Tertulia, Cali, Colombia. Photo Credit: Marie Helene Pereira, August 2017, courtesy of RAW Material Company. Me Gritaron Negra! Negra Soy! They yelled at me: Black! Black I am. And black, here, is feminine, of necessity. They yelled at me, Black Woman; they called me Black Woman. Even the men in the film shout it, dance it, are swept up in its rhythm and recitation, it’s hip and hip tight movement, that turning and twisting that marks how freedom and discomfort trace one another everywhere, mess up every messed up everywhere in sowing the topographical violence they carry. Victoria Santa Cruz updates a primal scene whose Fanonian iteration has, over the course of time, become an iconic reduction. Interpellative and ungendering force is now recovered and reclaimed. Description, hailing and naming Negra! bears converge in a general dispersion that even worries the unilinear, onto-grammatical force of soy. “I am whatever you say I am, but not the way that you say I am,” when said in concert, marks ensemble’s paraontological insurgency. I am not because we are, Negra’s essential and ungendered plurality, its saying’s irreducible handing turns to grooming’s grooved refusal to straighten and disentangle. Sound(ing) is appositional geography. Getting deep, as George Clinton says. De Profundis is our song of ascents, yet where we been is where we at. We bear that we been (t)here. Our rising fallenness is palimpsestic, contact’s layered shift and feel, release. Remain. Refrain. Refuse. Removed, what we do, we do over, till what’s done is undone, in haptic halo. More than illuminative. Now, what’s that sound(ing) sound like? In address of this question, in echo of an already given appositional bearing, Satch Hoyt arranges a sonicartographic coiffure. Fifteen black women from Cali, Columbia, dressed in varied styles and shades of white, walk barefoot on a stage and position themselves around an array of microphones. Silently, they raise their hands and in that silence, its spare, broad-edged, oceanic fullness, they begin to sound. They begin to comb their hair. Their hair is singularly plural, as indexed in an old vaudevillian joke, funny because in asking it remarks upon a metaphysical superfluity of asking. The question of which one combs her hair is equally given to impropriety. In concert, they begin to comb their hair. How hair gets arranged, dressed, did, Hoyt intimates, are ways of orienting, of mapping, that, in violent care, which takes the form of rupture, winnowing, a tightly organized leaving of traces, become the taking and giving of shape. Hair’s rich internal differentiation, it’s frizzy capacity to be on fire, to flare up over and against every act and condition(ing) of regulatory burning, relaxational frying, alchemical dyeing and side-lying, or—in the face of bed-riddenness—of an all but impossibly articulate folio of wraps, recites a prior resistance. Its malleable crunchiness and cut off crispiness bears percussive, anaproprioceptive implications. Their choir of rubbing, crinkling and pulling flees from the proper and the proposed as the countless hair of a collective head. Satch Hoyt, Hair Combing Cycle 1530, Museo La Tertulia, Cali, Colombia, August 19, 2017. Mapping turns, then (in)to echotopographical dislocation in Hoyt’s staging, which exceeds him in the non-performative pretension, the seductive presumptuousness, of the women he fixes but who won’t stay fixed, displacing his arrangement with unfurled anautonomy. It’s not that they form a body that knows itself in knowing the precise relations of its parts. It’s more like a feel whose real airiness in density gives a restrictive illusion of body away. Here, tender-headed tinder-headedness is more + less than individual proprioception. It’s a general proprioception that, say, the figure of the drummer taps into while lining out the ensemble in an already given independence of limbs—that light, thick booming in percussive, percaressive chorale, auricular tining and teasing, orchestral scratch. Satch isn’t so much head arranging for a band as setting up ritual conditions for various resurrective enactments—or, as Joseph Roach might say, circumatlantic surrogations—of anoriginal insubordination. In this regard, combing bears una historia de la reveuelta negra. Hoyt has long been a dj, subversively well-versed in the art of the record, of what it holds in being cut off from live performance. His work, in this regard, is a kind of phantom limn, blurring the line between impairment and augmentation, analysis and mimesis. The performance of Hair Coming Cycle 1530 records this loss and finding, which is handed on in the recording of that performance. When lyrical breakdown takes the form of grooming, its disruptive enhancement or retouching or overdubbing, it’s as if Hoyt reveals an essential attribute of the natural: that proprioception is a kind of violently non-localized tangle. You can comb it out but you can’t comb it away. Another word for such entanglement is diaspora—a shared, generative diffusion, a far-flung togetherness. This is the condition that hair describes. This is how, in Satch’s words and concepts, hair sonically maps the migration it bears and within which it is propelled, repulsed and desired. Here, there, it is movement, not place, that is mapped, place having been crumpled, twisted, pulled, locked and distressed in the restive statelessness of arrest within which movement, and what moves, and what is moved, is all but held. What moves moves with and against itself in deformative formation—braided, swept, as in the staging of a beauty shop as public sound booth turned to and in the retracing of halted steps and sunken strokes. Choreography, too, is (fore)given in something like brushwork’s percussive rasp, the concrete musicalization of a non-performative utterance discovered, now, as a symphony of combs. A comb is like a harp, in this respect, and the symphony of combs is a symphony of psalms insofar as the comb/harp is sung to by the hair it pulls, screamed at by what it frays and teases. The comb is a stringed instrument. Its plucking is percussive, out of the depths, can’t you hear? Combing is like a ritually coenobitic chanting of the psalter, a song of the song of ascents in descents and dissent, ours only insofar as it is not ours and on the other side of place, where the proper and the private redouble one another in brutal redundancy. I and I against I, they fan out, in flamed amazement, the fringe between comb and hair, like talons, or tines, of freedom, as the simultaneously exteroceptive and interoceptive instruments that play Satch Hoyt, as he would wish, because he is their instrument and our genius. Turning and twisting, tining and teasing, in “los talones de la libertad,” the repetitive insistence and phantomic, euphoric, anaphoric repercussion of black through performance, in presentation. Negra soy become Negra presuntuosa, seductive Black Woman, presumptuous Black Woman. Black Woman: in your authentic and essential pretentiousness, your deep and fundamental nonperformance, are you not? Are you nothing, other? Called out of your name(lessness) into a general naming, called out on the street where you live, calling out to your name between your street and my soul something of mine is lost where something of yours is hidden in a rhythm you hand to my accompaniment, and arrangement, and disappearance. How can we (help but) fall in love with/in the ungendered force repeating this repetition of naming bears? How do we (pro)claim this claim in this refusal, this dispossessive, anaperformative sharing? 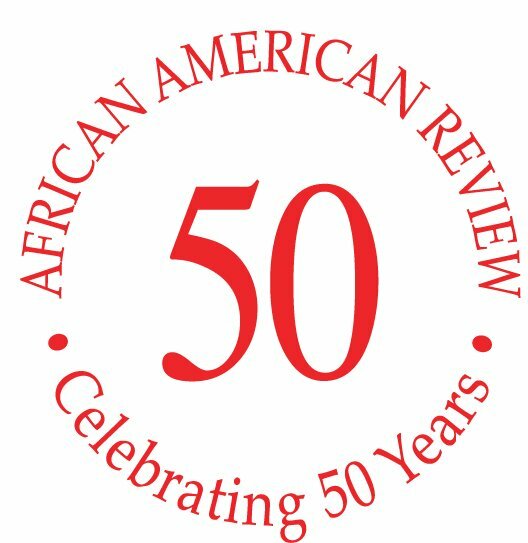 What does the expropriation of the word/name “Negra”—wherein black women take what has been imposed upon them, give what had been stolen, disrupting to the point of absolute distraction propriety, proprioception, personal coordinate, positional security—leave? How we are all that’s left is mystery. Author: Fred Moten Fred Moten teaches in the Department of Performance Studies at New York University.